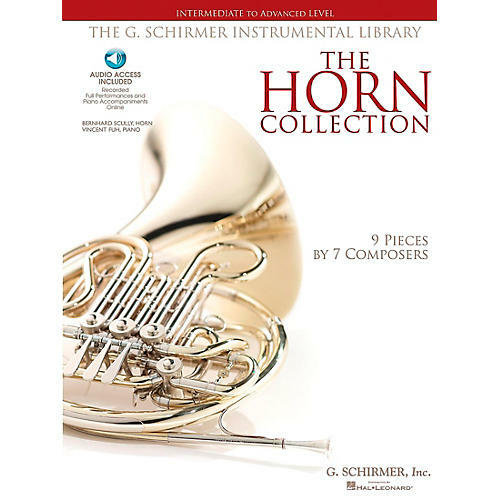 Solos appropriate for advanced high school or college players, this collection presents staples of the standard horn literature. Contents: Allegro moderato from Sonata for Horn and Piano, Op. 17 (Beethoven) · Villanelle (Dukas) · Moderato from Sonata for Horn and Piano (Heiden) · Allegro from Horn Concerto No. 3, K. 447 (Mozart) · Rondo in E-flat for Horn, K. 371 (Mozart) · Rondo from Quintet for Horn and Strings, K. 407 (Mozart) · Adagio and Allegro for Horn and Piano, Op. 70 (Schumann) · Allegro from Concerto No. 1 in E-flat Major, Op. 11 (Strauss) · Allegro from Concerto in D Major for Horn and Strings (Telemann).